While I managed to get the library in a habitable condition, I still couldn’t figure out what to do with my art supplies. I’d earmarked the front hall closet — convenient to the library — for my art stuff, but I had many many bins and boxes of supplies — far more than would fit into that closet space. This week I finally brought all those boxes and bins down from the attic, and sorted out the space. Well, I should clarify. On Thursday, when I’d finished all the pressing client work for the day and had another hour of babysitting to put to use, I decided that THAT would be a great time to get the art closet sorted out. So I ran up and down the stairs, lugging everything downstairs from the attic. I took many things out, filling the hallway with my bits and pieces. I made a big ol’ mess. But then I got stuck. I was well and truly stuck (Fireman Sam, anyone? ), and the timing was terrible. I really should have been preparing for my four-year-old’s birthday party — somehow I’d managed to invite nearly a dozen pre-schoolers to the house for Batman festivities on Saturday afternoon, and had many things left to prepare. (Yes, I really am nuts.) But there I was, late on Thursday afternoon, having turned my front hall into complete chaos, with no exit strategy in sight. What’s a girl to do? Happily, my mother was coming down on Friday anyway, so it wasn’t too hard to rope her into lending a hand — and a lot of moral support — so I could clean up the mess I’d made. After I turned the corner with the organizing, we had to go out to do some errands — and I picked up a hanging shoe organizer for smaller items, which was just what the closet was missing. Now, as you can see from the photo, it’s an organized space. I can find everything I need. And if inspiration is in short supply, I need only pull open a drawer or two and the ideas come wafting out. I didn’t have room for everything; a few bins of more specialized supplies went back to the attic, and a bin of kids’ art projects got stashed on a tall shelf in the playroom, but my basics are here — as is a bin of basic supplies for the kids. I wanted it to be easy to grab the bin and do something fun with the little ones, rather than having to drag a box down from the attic or bring it up from the basement. It’s satisfying to have the closet sorted out, but I do wonder why I’ve had such a hard time getting my own creative things sorted out in our new space. What’s the block? Is it as simple as not wanting to have everything organized, because once it is, then I have no excuse not to work? That angle doesn’t really resonate with me, but who knows. How about you? If you’ve ever had a room of your own, did that space have priority in your life? And if you don’t have any personal space, or your creative space is shared with many others, do you correlate the state of your space with the state of your creativity? Is that why it so often gets pushed to the bottom of the list? i dream of a space of my own. my bedroom even has always been the ‘in the midst’ storage space as well as we now have the crib in there with us. however, i do try carve out my piece of it and my piece of the office space. i have a little spiritual alter in the corner of my bedroom(that is currently collecting dust which says alot about the pecking order of paying attention to my needs). and i have my seems like 1 foot space in the office, which is always being encroached upon by the kids. one day, not so far from now, K will be away at college, at about the same time that C will be entering Kindergarten, so i think i will have time and space to carve out a little more for me in about 4 years time. is that awful or realistic? just this morning i was dreaming again of starting up a little painting or pottery again, when there’s a little less chaos and crowd in my house. Now that I partially cleaned out the garage I love going out there and being messy. I think the main thing for me is being able to leave things out and not have to clean off the dining room table every time. I have also tried to integrate our art supplies together after reading Amanda Soule’s book. I agree mostly with the idea that kids should have access to all the art supplies (except toxic and Sharpies) so they don’t feel their stuff is any less important than our’s. Being somewhat organized really helps so you don’t spend 10 minutes looking for something. Your organizing is very admirable! yeah for space! great job getting to your organizing, miranda. as far as this question: “Is it as simple as not wanting to have everything organized, because once it is, then I have no excuse not to work?”….the answer for me would be yes. i’m guessing at this point it may also be yes for you. i am the world worst procrastinator…combine that with the fact that, in my head anyways, my studio has to be in somewhat of a working (meaning clean) fashion before i can work on anything, i sometimes go a little crazy. add to that that even though we built the girls a very nice little art bench (8′ long by 2′ deep! ), they still gravitate toward my space, whether i’m in it or not, but always when i’m in it. a typically saturday or sunday working in my studio will have my DH on the couch around the corner watching TV, the dog AND cat at my feet pretending not to like each other, and the two girls behind me on my other bench (my studio has a u-shaped table top all the way around). so yes, all of us short of the husband (the lone male in the house, including the animals) crammed into my space. 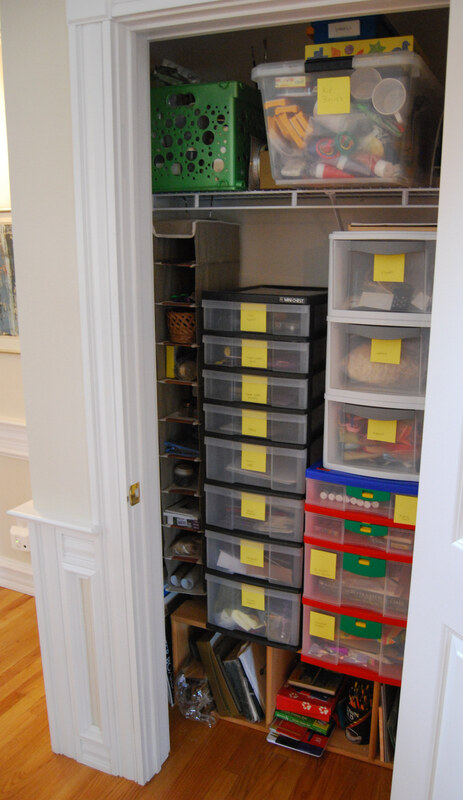 organization is a must but it rarely happens….organized chaos, yes. I have my own office, but even when I have it organized, it remains the dumping ground for the rest of the house. And since my life is such a hodge podge of projects–mail and correspondence, photographs, writing, reading, dollmaking, embroidery, and sometimes party planning, and small child entertaining, there’s any number of things crowding me out of my own space, even when it’s all my own stuff. I think my space (and maybe yours?) is a metaphor for my inner life. I try to keep it organized and functional, but it is constantly encroached on by all the other things going on that nobody is going to deal with unless I do it. I don’t even like going in there anymore, because in order to do any work, I first have to deal with all of the things I put off dealing with that landed the papers, magazines, toys, etc. in a disorganized heap in my office in the first place. And I don’t know about you, but I’m beginning to think I need two spaces. One place to pile my stuff where I can get to it and organize at my lesiure, and one place that is a bare, open space where I can abdicate all responsibilities and work on the project of my choosing without interference from anything else.